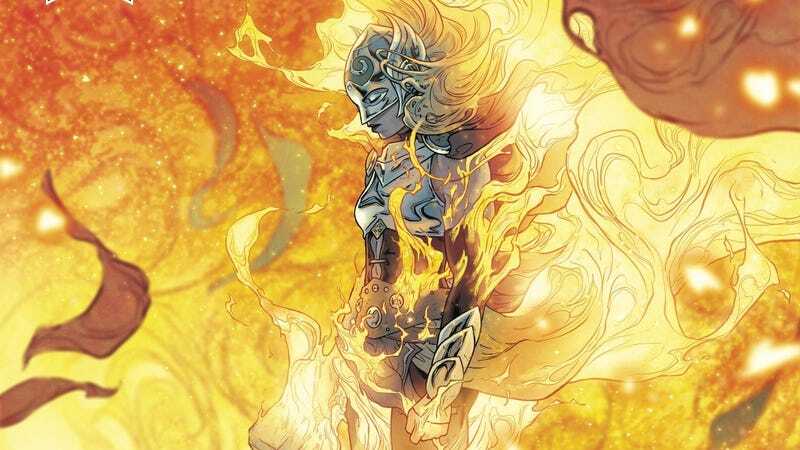 Jane Foster’s time as Thor is coming to an end, but she’s going out in a blaze of glory fit for a legendary superhero run. Writer Jason Aaron, artist Russell Dauterman, and colorist Matthew Wilson gave the Marvel Universe a thrilling, tragic hero in Foster, who has been battling cancer while fighting for the Nine Realms in a devastating war that has only intensified with each day. The effects of Jane’s chemotherapy are negated every time she transforms into Thor, and her human body is on the verge of death when the rest of the realms need her most. Jane’s journey as the god of thunder has been a highlight of superhero comics for the last few years, and this creative team made this heroine a major part of the Marvel’s line-up by consistently raising the stakes for both Jane and Thor. Dauterman and Wilson’s artwork for this series has been radiant, powerful, and deeply expressive from the start, and this exclusive preview of next week’s The Mighty Thor #705 showcases all three qualities with a somber flashback that explodes into exhilarating action. The two splashes are great examples of how this art team approaches the different sides of the Jane/Thor dynamic: There’s a softness and stability to the visuals when Jane is the dominant force, and even though she’s dying, she’s keeping it all together with a sense of grace. When Thor is in charge, the compositions become more forceful, the layouts more chaotic. Lightning crackles in delicate wisps when Jane first grabs the hammer Mjolnir in the flashback, but Thor is a raging storm when she’s battling the vicious Mangog for the fate of Asgardia. Dauterman skyrocketed up the ranks of superhero artists with his work on this series, which navigates the delicate emotional state of a dying hero while delivering truly spectacular superhero action. There’s remarkable balance in his art. Brutality is balanced with serenity. Destruction with beauty. Strength with vulnerability. And that balance is reflected in Wilson’s colors: Hot with cold. Bright with dull. Aaron gave this art team a story that pushed them to new heights of greatness, and it made Jane’s time in the spotlight an unforgettable adventure. Marvel finds new angles for Earth’s Mightiest Heroes with Avengers Now!